I think this tank uploaded on the international side just in black this past week but Australia has it in Aquamarine as well. 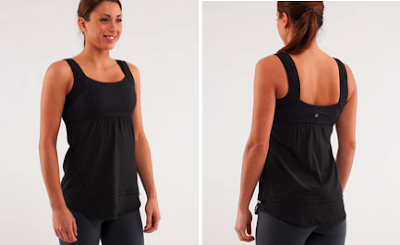 I’m quite intrigued by this tank because the bodice is made of Swift material just like a lot of the run shorts and skirts, and the bust is luxtreme which I love. 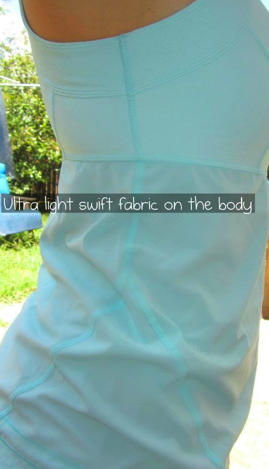 I really hope it’s 4-way stretch actually because 4-way Swift is cool and light and feels like silk and the 2-way is just a bit stiffer, I think swift also shows sweat quite a bit. I also really LOVE that this tank doesn’t have a bra in it already. 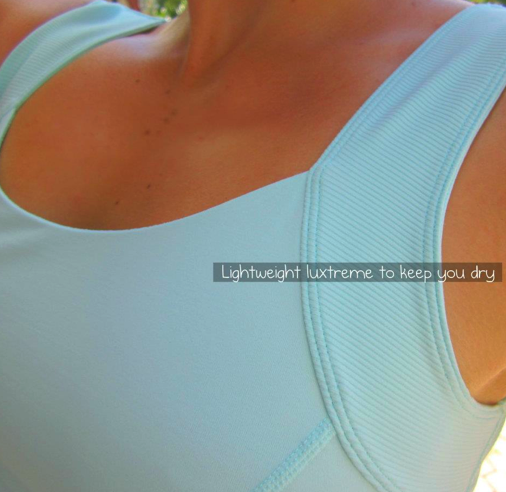 I prefer to layer my own bras under tanks and I find when I buy a bra tank I don’t end up wearing it much. The back looks like a Ta Ta Tamer would be hidden by the straps nicely. Since I’ve been wanting to get a technical tank in Aquamarine I think I will wait for this one. "The Flow and Go Tank is Back! And Photos of the Apres Practice Anorak"